So sorry it has been such a long time since my last post. My new responsibility of hosting a television show called Market Journal here at UNL has kept me crazy busy! One of my most cherished photos from a consulting trip I made several years ago as part of the International Farmer-to-Farmer program. 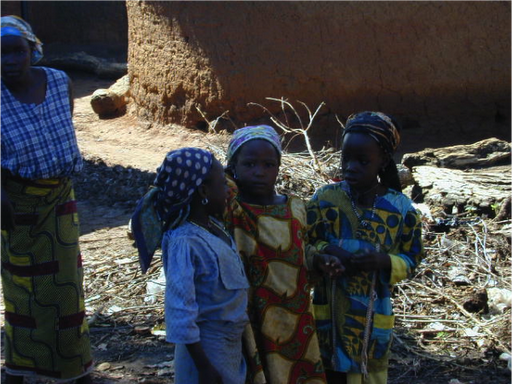 These three young girls lived in Lungun Dankande Village in Nigeria. They were so fun to watch…and quickly became my buddies! According to the United Nations, the world’s population hit 7 billion on October 31, 2011. The United Nations is projecting the world population to reach 9.3 billion by 2050. The new population landmark set off alarms in governments and organizations around the world. Most of the growth will occur in the poorest and least developed regions of the world, which already must work to resolve issues related to shortages of quality food, soil, air and water. Many people living in these countries also lack access to education, healthcare and global political capital. More developed countries face many of the same issues in a different way. Agriculture has been so successful that many people living in the developed world enjoy a high degree of food security but are separated from the growth and production processes. Consumers, in places like the United States, have become accustomed to buying whatever they need or want at a low price. Many consumers see only finished products in attractive wrapping on their shelves. For these people, it is difficult to understand the role that agriculture plays in their daily lives. It is also difficult for many people to understand the relationships between high consumption and environmental and political stability. Each additional person added to the world’s growing population consumes food and natural resources. They also consume energy and produce waste. How will we continue to feed the growing population? What are the social and economic implications of landmark growth? And, what will this all mean to our natural resource base? Nebraska sits in a unique place with this new population landmark and predictions of explosive future growth. As a leader in agriculture, the big red state is emerging as a major player in the world’s future-even more so now than in the past. Agriculture will experience new challenges and opportunities related to population growth. The expectation of increased productivity with less land and water is a global challenge. Further, increasing agricultural productivity is only one part of the equation. How is the world going to deal with increases in consumption of natural resources and the output of waste as well as unknowable social and ecological issues associated with a high population of human inhabitants? Governments and people must find creative ways to produce food and address global nutrition. Further, food production is not enough. Political and social issues must be addressed to make sure food reaches consumers around the world. The private sector is now incorporating environmental sustainability and social responsibility into their business models and plans. Water is a prime example of the importance of natural resources in organizational strategy. Many corporations are now incorporating water into their business plans. Water is a great example of how the growing population will force the world to innovate in ways in which we can’t yet imagine. Innovation is a popular word these days, so what exactly does it mean? Innovation can be defined as, “coming up with new ideas, products, collaborations, services and solutions that can be used” (Reimers-Hild & King, 2009). Creativity is certainly an element of innovation; however, it does not always translate into innovation. Remember, the “that can be used” element of the definition of innovation. Use and implementation is fundamental to innovation. If something remains only an idea or a thought, it is not an innovation. Innovation requires action and change. individuals and communities must also make innovation a priority as our planet’s population rises. Innovation has become an essential to survival and success in the 21st Century. Globalization combined with the rapid rate of change and explosive population growth have created a need for entrepreneurial activity, both inside and outside of new venture creation, that leads to continuous innovation. Research has shown that entrepreneurial individuals (Krueger, 2000) and leaders (Gupta, MacMillan & Surie, 2004) are needed to address complex economic and global issues. Entrepreneurs are needed to establish new ventures and to employ others while developing new products, services and solutions. Entrepreneurial individuals, who may or may not start a business, are needed because they are innovators who behave or act in a proactive manner and move organizations forward. In general, entrepreneurial individuals have the ability to recognize and capitalize on opportunities, innovate, take calculated risks, adapt to rapid changes and marshal resources to achieve their goals. Entrepreneurial leaders are the individuals who have the ability to create dynamic, competitive organizations where innovation and change are as common as employee, clientele and stakeholder support (McGrath & MacMillan, 2000). Entrepreneurial leaders must create unique organizational and community cultures characterized by innovation in this era of explosive population growth and uncertainty. This is especially true in the areas of food security and social stability. Feeding the world will require leaders around the world to collaborate and leverage the talents of individuals while also cultivating continuous innovation. PS: What’s really cool? You can find this article with the QR code below!